During the month of March the MID public safety patrollers responded to two incidents of couples fighting in public. In the one case, a couple fighting while walking to their home in the Village, and in the other case, two car guards. In both cases the victims refused assistance and walked away with their partners. Domestic violence is a reality for many and seeing this on the streets of the MID area is a concern. How do we empower females to seek help? At a glance, the statistics for March public safety. 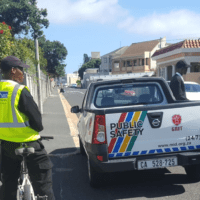 Observing the Muizenberg Community Safety Initiative (neighbourhood watch) alerts, the patrollers were able to assist, responding to 18 reports, including one of a couple being threatened at knife point while on-route to the shop. The suspect was found, but the victims refused to open up a case with SAPS. The refusal to report crimes to SAPS remains a big concern in the MID area as statistics is key to deployment of policing resources. The public safety patrollers not only observe suspicious behaviour in relation to crime prevention, but also behaviour that requires medical or social work intervention. On the morning of 13 March at 6am, MID safety patroller, Senzo, noticed a truck driver “asleep” in his vehicle. Upon further investigation it became clear that the driver was ill and in need of medical assistance. The control room was immediately contacted and an ambulance was requested, Senzo stood down until the medica arrived. The truck driver was taken to hospital and the owner of the truck was informed accordingly. In another incident MID patrollers responded to a pedestrian being knocked over, sustaining serious head injuries. CMR was on the scene within minutes and managed accordingly, the injured man was taken to hospital. Working closely with Law Enforcement, the patrollers provided ad-hoc support during site patrols and operations in the area. The patrollers also work closely with Metrorail/PRASA, conducting ad-hoc site checks along the railway reserve for any signs of suspicious activity. 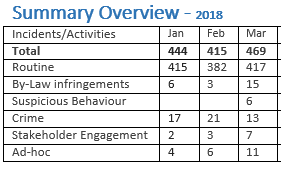 The detailed public safety report for March can be viewd here.